Saturday is Earth Day, an annual event where we focus our efforts on environmental issues and encourage everyone to "go green". 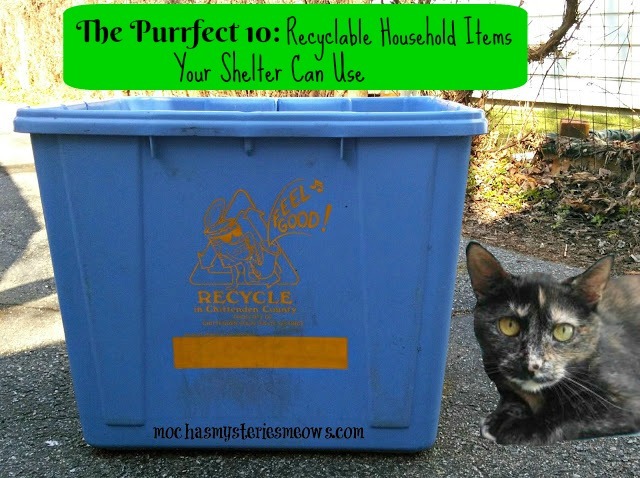 We're also right in the middle of spring cleaning season, and did you know that many of the items in your home you might be thinking about tossing in the trash can actually be used by your local shelter? Save the planet and better a cat's life...that sure sounds like a win-win to us! 1. Old socks have a multitude of uses, from catnip kickers to kitten sweaters to heading pads. 2. Carpet remnants can be repurposed into makeshift scratching posts hung on the side of a cage. 3. Plastic storage totes with cut-out "windows" can be bolted together to make super cool cat towers. They're easy to clean too! 4. Foam bins once used to keep your food cold can be turned into a feral cat shelter with the addition of some straw! 5. Cardboard trays from canned goods make pawsome disposable litter boxes. 6. Wine corks Please tell me I'm not the only one with a jar full of wine corks in my kitchen? The designs on some are so pretty I just can't bear to toss them out, but they can be repurposed into a cat toy! 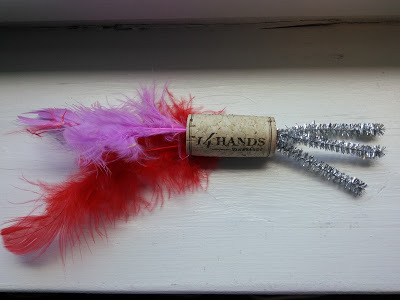 I cut a pipe cleaner into three pieces, then made holes on both sides of the wine cork with a push pin just big enough to push in the pipe cleaner pieces and feathers. Pieces of rick rack would work nicely too. This toy gives kitty something to sink their claws into, bat, drag, and toss around. 7. Old suitcases lined with warm blankets or towels make the purr-fect size cat bed. 8. 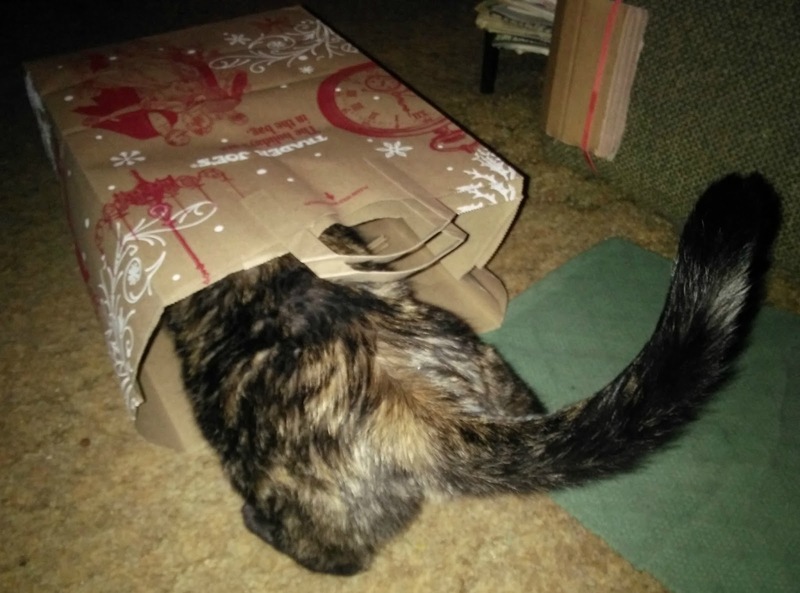 Paper bags I have stacks in my basement which I use to collect my recycling each week, but paper bags can also create endless sources of fun for cats. They love to pounce on them, nap on them, and for timid kitties they make a great hiding spot! 9. Recycled Paper: Newspaper can be used by shelters to line the bottom of animal cages. Scrap paper and wrapping paper can become an inexpensive ball. 10. Fleece fabric and pillowcases can be turned into a comfy hammock to fit inside cat cages, and are easily laundered. Instructions can be found here! This is just a small sampling of items that are needlessly filling up our landfills. Can you think of anything else that can be repurposed into something an animal in need can use? I love this list, Mudpie and Melissa! I am a huge fan of upcycling and recycling, and these ideas are purrfection. Oh, I could just whap my human for her stupidity! (Although you know I would never really do that!) Every time she gets a hole in a sock, she has been throwing it out... when she should have been saving them to donate to a shelter! This has been going on for years! She has probably thrown out a couple dozen socks. Maybe it's me, but I can't get the link to making a hammock open. I'm intrigued by this! Great ideas! Thanks, Melissa (and Mudpie). Excellent post, great ideas to recycle. Sandy, the link opens a PDF document download. Click it again andlook for something downloading. On my tablet I have a down arrow in my notifications for downloads. On my laptop with Chrome browser it shows as a download doc on bottom of the screen. Intructions look good for the hammock. High paw for a great post! It's a great reminder that shelters have needs beyond cat food and litter, and we may be able to help in ways we might not expect! I’m always concerned about the junk that needs tossing. But I’m hesitant when I think about our landfills. Great list you put together! Next time we will donate some of our old cat trees to a shelter.